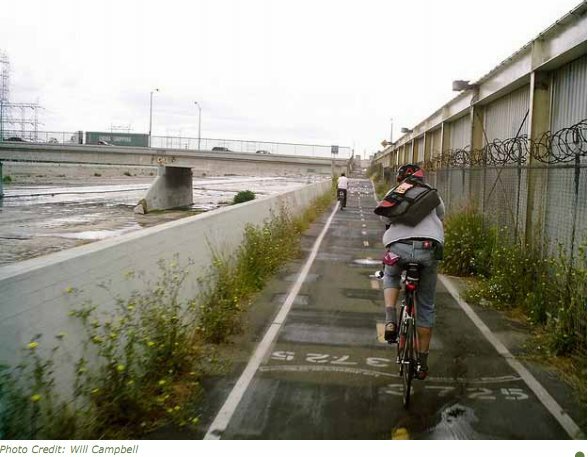 A view from the cycle path: Los Angeles has a plan, but is it enough ? 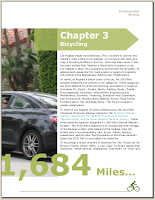 Los Angeles has experienced some significant growth in cycling in recent years. 13000 people in the city now commute by bike. The growth is something that Los Angeles is proud of, and quite rightly so. However, this is a large city. 3.8 million people live in the city itself and almost 15 million people live in the urban area. That's very nearly the same population as the whole country of the Netherlands, but Angelenos live with much higher density1 so there is much less to be done. Are the numbers actually impressive or not ? Despite the density, very few people cycle in LA. 13000 commuters may sound like a large number, it's not. This is a huge city with a huge number of potential cyclists. If it were an average Dutch city, over 3 million journeys would be made each day by people who lived in Los Angeles itself, and 12 million journeys each day by residents of the urban area of Los Angeles. There would be a million journeys per hour by bike through the working week. When cycling is truly successful as a mode of transport, it is something done by everyone, all the time. Even though cycling has grown in Los Angeles, the result is a cycling modal share of around 0.3% of journeys. This is orders of magnitude lower than average in the Netherlands. So what's happening about it ? When looking up another story which mentioned Los Angeles a few days ago, I came across the city's bicycle plan (also here). This is quite an interesting document in many ways. The plan describes a proposal for "an ambitious 1,684 mile bikeway system". This number is clearly important as it appears in particularly large print in the document. Apparently this will "build off the existing 334 miles that have been installed over the past thirty plus years". Does that indicate that the rate of cycle path building over the last thirty years has been 10 miles per year ? Well, actually, no it doesn't. I first thought that a "bikeway" was a cycle path separate from the road, but actually it's not. A "bikeway" can be almost anything. Most of the "bikeway system" actually refers to on-road treatments of one kind or another. Of the existing 334 miles, only 49 miles are "Green Paths" segregated from the road. Of the proposed new 1350 miles of "bikeway", only a further 90 miles of "Green Paths" are proposed. And what do these off road "Green paths" look like ? I've not seen them myself, but to the left is the example chosen by the authors of the plan to illustrate them. Presumably this was chosen because it's a good example, however to my eyes it is very much an example of doing the wrong thing. If conditions even on the "Green paths" of L.A. resemble this photo, then I think we can see why it is that so few people cycle there2. The photo shows an example of design with no regard at all for social safety. It's not a very inviting place to be in the daytime, and very many people would avoid this in the dark. It looks like a mugger's alley and will not attract the average person to cycle. The plan's discussion about the "bikeways" includes a bit of history. While only 334 miles exist now, the 1977 plan actually promised 600 miles, and the 1996 plan promised 742 miles. Previous plans were not even half implemented: 408 out of 742 miles of the "bikeway network" that should exist by now simply does not exist. While it is true that the new plan "exceeds its predecessors substantially in its commitment to bikeways", can we have any confidence that this plan will be followed any more closely than the previous ones were ? Sadly, the time-scales allocated make this almost inevitable. On page 107 the plan says that the extra 1350 miles of "bikeway", and 90 miles of separate "green paths", are to be built over the next 35 years. Yes, 35 years. Now that's a long term plan ! If it all goes to plan, and this network actually gets built, then Los Angeles will in 35 years time be able to claim to have built an average of 2.5 miles per year of extra "green path", or perhaps 39 miles per year of on-road paint and other tweaks. This really is not impressive at all. This policy document leaves all the decisions for future office holders, who may or may not go through with the plan. History tells us that they likely won't build more than half of what is planned. Luckily for those who made this lack-lustre plan, setting such a long term target means that most people involved now will be retired before anyone asks them to answer for what they've done, or perhaps more likely, what they've not done. The Netherlands, which remember only has a population slightly larger than the urban area of Los Angeles, now has 35000 km of high quality completely separate cycle path. In addition there is an unknown length of lesser quality touristic separated paths, 5000 km of on road cycle lane and many thousands of kilometres of road which have been prioritized for bikes. Infrastructure here is being built at a rate many times higher than that in Los Angeles, and what is being built is to a much higher standard. Los Angeles can only continue to fall behind if it makes plans like this. Under the title of "Equity: parking", the authors say that "Safe, visible and accessible bicycle parking is essential to encourage greater levels of bicycling activity." In this, I think they're right. There must be enough parking spaces. So what has the city done ? Currently there are "over 3600" cycle parking spaces, and "bicycle parking must be provided at a ratio of two percent of the number of auto parking spaces" at some kinds of developments. Is 2% an aspirational target ? And can 3600 spaces on street shared between four million people who live in the city be seen to be anything better than scraping the surface of what is required ? 3600 doesn't even come close to supporting a 2% modal share, let alone true mass cycling. By way of contrast, and bear in mind that this is for a very similar population to Los Angeles, there are literally millions of cycle parking spaces in the Netherlands. Over 300000 cycle parking spaces for bikes have been provided at railway stations alone, and this figure grows by 25000 per year. To keep up current growth rates in cycling, Groningen, a city with one twentieth of the population of LA is currently adding 500 spaces each year to just one of its cycle-parks. Residential properties in the Netherlands must provide an area for secure bike parking which is 6.5% of the floor area of the home. i.e. Enough space for the family's bikes to be stored in safety. And what else does the LA document say ? Well, they make a point of dividing cyclists into three categories - Advanced / Experienced, Basic / less confident, Children with or without their parents. There is a suggestion that parallel facilities will be built for these different types of cyclists. This is a fundamental error. To build down for inexperienced cyclists is a waste of time. Good cycling infrastructure suits all types of cyclists. Infrastructure which isn't good enough for the experienced to use for efficient journeys without problems definitely is not good enough for the inexperienced to use either. This is doubly ridiculous when there clearly isn't enough of a budget to build one good network, let alone three. Angelenos ! You're being fed a line ! There are a lot of expensive consultants' words in that document, but this is not how real progress is made. The Dutch also had a bicycle master plan back in 1990 but they set high targets and since that time, they followed policies which resulted in real change. That is the reason why a population just slightly larger than that of the L.A. urban area now make an extraordinary proportion of their journeys by bike, whatever their age. The same could perhaps be achieved in L.A., but the current plan isn't even scratching the surface of what is required to make it a reality. People elsewhere ! Don't expect too much just because a lot of words appear in a plan. You need to make sure that any plans written up actually make sense. Be wary when the same consultants are involved as helped with other lacklustre plans. Make sure to keep to the very highest standards. 1: 2570 people per square km in Los Angeles vs. 402 per square km in the Netherlands. Nowhere in the Netherlands compares with the high population densities of large US cities. 2: While reviewing this article I was sent this link to a discussion about one of green paths in Los Angeles. A couple of quotes: "The consensus is that this path might be one of the nicest in town, however, check the comments below, because some cyclists think it goes through some pretty bad neighborhoods, while others don’t. But, if you can feel safe (e.g. with a group), it’s a nice, pretty, breezy ride...", "It is generally a nice ride during the day, though I would recommend avoiding it after dark (no lights and bad neighborhoods are potential problems). I occasionally come across “less than upstanding looking citizens” on the way", "It certainly isn’t all that bad. Of couse, you wouldn’t want to ride it at night, but that’s because the path isn’t lit, and there’s no barrier between the path and the canal....", "some punks have been breaking glass bottles along the route lately, and it doesn’t appear that the city does much to maintain the path". Another path description says "Sadly, like so many of the bike trails described here, large sections of this path are incredibly run-down, virtually junkyards. ", and another is "not very highly recommended, unless you’re into gangs and graffitti". Not everyone agrees, of course. Some people are always more sensitive than others. However, there is clearly a problem with social safety on these paths. I know there are problems with money in L.A. but it's a false economy to ignore cycling because of this. Cycling infrastructure is cheaper to build than not to build. Thank you for this detailed post about the bike plan in my city. I was unable to get your 3rd link, 'Los Angeles', to work. Here are some additional links on the subject. 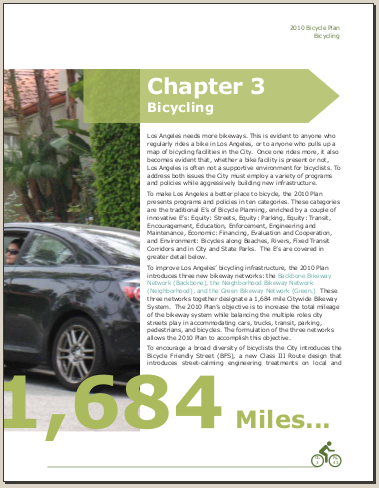 Joe Linton, a Los Angeles advocate for bicycling, wrote this very detailed article, Correcting L.A.’s Stated Bikeway Mileage. We here in the L.A. cycling community are eagerly awaiting the September visit by Dutch design experts. By coincidence, I was on the Ballona Creek bike path today (see your footnote #2). In my opinion, all of the comments about the Ballona Creek path are accurate. Social safety is my biggest concern and that is why you will not find me on that path in darkness or certain sections during off peak riding season. This is a newly renovated portion of the Ballona Creek bike path in Culver City. P.S. I wish you were a part of the ThinkTank Los Angeles delegation. The same can be said of Australia's cycling plans... lots of bureaucratic fluff with no firm commitments (or funding). The only 'growth' in cycling numbers is in proportion to population growth (so no real growth at all)! Recreational cycling has grown considerably but it should be the tip of the iceberg, not the bulk of it. The LA Bike Plan was regarded as a big victory for activists, the plan is a lot better than it could have been. While it designates only 90 miles of green path, the lines that are purple on the map to indicate the backbone are not finalized in design. That is, if we fight hard enough we may get separated bike lanes/ 'cycle tracks' similar to what's seen in Long Beach and New York City on some of the backbone network. if these campaigns are successful we may get bicycle facilities that exceed mere painted bike lanes and similarly can be said elsewhere for the other communities in LA. Anything we want we will have to fight for and hopefully will be successful and that means better facilities than what we would otherwise be handed. Thanks for taking this critical look at Los Angeles, you have a lot of LA readers who appreciate this! I always get a kick out of this quote, from an 1897 newspaper article: "There is no part of the world where cycling is in greater favor than in Southern California, and nowhere on the American continent are conditions so favorable the year round for wheeling." Indeed, the modal share for bicycles in Los Angeles was 20% in 1900. Mikael: Nice quote. With a climate like that it ought to be much easier to get people to cycle than when they're faced with winters as they are here or in CPH. However, it's not going to happen by following the plan linked to above. "I hope it doesn't all look like this." That's the obligatory showcase scenic path along the river, so it really isn't reasonable to expect it all look so good. It's crazy what they expect. This kind of plan is clearly just something to placate folks that they wish would really just go away. It's important to not go away and to continually be involved and insist that your voice is part of the circle of decision making. At some point they will learn that you're here to stay and they'll start listening. Thank you for featuring Los Angeles on your blog. As a biker and resident of Los Angeles, I agree with your observations and the pace of change here is really frustrating. There are a number of really engaged bicycle activists and organizations in town and they probably share your vision. These people are well informed and knowledgeable, and know what truly good bike infrastructure is. When the Dutch experts come later this month to offer suggestions to our community, I'm sure everyone will laud their ideas; implementing them, however, will be an entirely different story. It's extremely difficult to get anything truly visionary, along the lines of what you promote, done here. There are huge cultural differences between the US and Western Europe. David - if you magically moved to Los Angeles and became a full time bicycle activist, what would be the three things you would recommend ordinary citizens with limited time and resources to do to effect positive change in the direction you promote, knowing full well the political gridlock, embedded car culture, low civic involvement (I think I read somewhere recently that only 14% of our population votes in municipal elections! Maybe that number is wrong, but it's something quite pathetic) and resistance to change in this community? What would you personally do, as well? Despite the heroic efforts of a small number of activists and advocacy organizations, I imagine that true change will only come with some broad-based support from the public, especially when it means removing car lanes from traffic, and possibly taking away parking spaces. But these people need to have some tools and feel empowered to do something that will make a difference. I have a stylistic recommendation, Mr. Hembrow. When displaying lengthy numbers, do separate the digits in increments of three. It would make for easier reading. For example, "1000000" is rather harder to read than "1 000 000", "1.000.000" or "1,000,000." Now if you're not laying down comparative numbers across a screen, that said number is simply within the sentence or paragraph of a larger thought or point, then a journalist style of showing the numeral and then the quantitative word would suffice: as in "1 million." Forgive my pedantry, but reading should be designed as visually easy to do as possible. Valid points, but the LA Bike Plan still a positive development, significant & useful for car-dependent cities everywhere. I am confused by your mentioning the urban area of Los Angeles as 15 million people, as defined by Wikipedia. They included the city of San Bernardino, which is 60 miles east of Los Angeles. A rather long commute to L.A., I would think. You also state that there would have to be one million people riding bikes an hour in Los Angeles to match the riderhip of the Netherlands. That would be quite a feat for a city of 3.8 million people. At any hour of the day almost a third of the population would have to be traveling around on a bike. The best example, that I know of, for a bike path along a major street in Los Angeles is the Orange Line bike path, which is about 8 miles long and runs next to the 14 mile Orange Line BRT busway. The pathway is not continous and at about 4:50 minutes into the video the official busway path turns into a park bike path that existed before the bus line was built. The park path has no lights, as it was intended for recreational use during the day. The official Orange Line bike path starts again at about 9:20 minutes into the video. At the busway stops there are bike racks and also bike storage boxes that can be rented for 6 months. Twelve of the busway intersections have red light cameras, which can be seen either on a traffic signal or on a pole to the right of traffic signals in the video. This has the side benefit of creating a much safer crosswalk for the pedestrians and cyclists. In California it is legal to turn right on a red light, which means that cars will encroach on the crosswalk when pedestrians or cyclists are crossing the street. It also is legal in Los Angeles to ride a bike on the sidewalk and in many areas of the city that is the dominant means of traveling on a bike. The biggest downside to this bike path is that the cyclist is treated like a pedestrian, and is expected to push a pedestrian walk signal button at most of the bike path intersections. These interruptions create a bike path that is much slower than if you were cycling on the street. Four new bikeways features that will be used soon in L.A. are bike intersection signals, Sharrows or shared roadway use markings, way finding signage and green paint for bike boxes or lane marking. 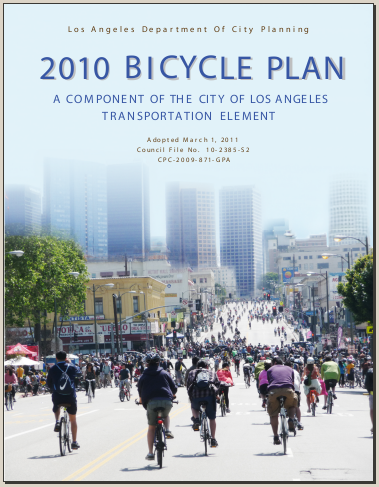 I am hoping that the Dutch bike infrastructure experts will be able to influence not only the city government, but also point out to state Caltrans officials, the antiquated State and Federal engineering rules that are followed by the book in L.A., which hampering increased bicycle use. Not all cities in the Netherlands use bike paths as the dominant means of bicycle infrastructure. It's my understanding that Zwolle mainly uses bike lanes on less traveled streets and mostly avoids putting bike paths next to the main streets for motorized vehicles. This method has a lot of potential for Los Angeles and several streets in the bike plan are slated to get treatments that would make them much more bike friendly. The downside to this idea is the expense of putting in bridges and tunnels, as Zwolle has done, to help bicyclists get past the busy streets. Portland Oregon has decided that putting in bike boulevards, along less traveled streets, is the preferred method of bike infrastructure for their city, and have committed to $30 million a year to achieve a goal of 25 percent modal share within 20 years. Chicago's new mayor has stated his intent of putting in 25 miles a year of protected bike lanes, and they they have just completed the first one, at a length of one-half mile. This pace is about the equivalent of 40 miles per year of protected lanes for Los Angeles. Hopefully, L.A. will be inspired to follow the success of these other cities and commit to putting more resources into building higher quality bike infrastructure. Dennis: I was quite clear about what I said. The urban area of LA has, according to wikipedia, 15.2 million people. That's nearly the same as the population of the Netherlands. You may find an area 60 miles wide to be large. I don't. In comparison with your relatively compact urban area, I'm comparing with a whole country which is far more spread out. Just because it is possible for a journey to be 60 miles in length doesn't mean that all journeys are long, or even that a very larger percentage are. In fact, 40% of all urban journeys in the US are 2 miles and under and of course these are the ones to target first, not the much smaller number of journeys which are of 60 miles in length or greater. The Netherlands covers a considerably larger area than the urban area of LA, so any objections that you have about journey length could be viewed as just as significant here. Yes, it's quite a feat to have over a million journeys per hour, every hour, of every working day, but that is what the Netherlands has with about the same population as the urban area of LA. If you want to consider just the far more dense area of the city of LA, think about having a quarter of a million journeys by bike every hour of every working day. That would be equivalent to any average Dutch city. The path you give details of is indeed quite grim. It's narrow, has walls either side, leading to low social safety, no lighting after dark (as you point out), and it stops and starts rather too often. (cont) By comparison, take a look at the growing network of intercity cycling superhighways which are being built in the Netherlands. These provide for long distance travel with few stops. In the cities as well, stops are avoided as much as possible as it's important even for average and slow cyclists to be able to achieve speeds which are advantageous over driving. I suspect I've visited Zwolle more often than you have. I assure you that there are plenty of really nice cycle paths there. I've read the Dutch document which says that Zwolle is a city of bike lanes, but you have to bear in mind where they're coming from, and allow for some loss in translation. Sometimes the Dutch seem to go out of their way to confuse people. If Portland think they are "copying" Zwolle by only doing Bike Boulevards, they've got it very wrong indeed. Also, keep in mind that when the cyclists go on less travelled streets here, that doesn't mean they get put onto indirect routes with a lot of stops. Rather, the direct route is converted for cycling, and drivers are sent on a detour. This is done all across the Netherlands, and I have several examples on the blog. One street in particular in Assen demonstrates it well. Traffic lights are rarely a problem for cyclists. A dilemma for Los Angeles, compared to the Netherlands, is that the bicycling rate is at 1% or less of all travel and the Dutch are at least 27 times that. That means financial commitment to providing bicyce infrastructure in L.A. will naturally be much less of the cities overall transportation infrastructure spending, than it would be in the Netherlands, as cycling has not been shown to be a significant proportion of travel in Los Angeles. Los Angeles has 6,500 miles of roadway and a bikeways budget that has recently been 10-11 million dollars per year. So, should L.A. concentrate on trying to get 8-80 year olds to cycle by spending $500,000 or more per mile for a few miles of bike paths, or go after a larger geographical territory, by spending an estimated $18,000 per mile for bike lanes, to attract the mostly young male riders. Then, after gaining ridership with bike lanes, L.A. could go back and make improvements to this territory that that was set aside for bikes, after gaining greater financial support by having increased cycling throughout the city. Dennis: I take it that you know that the approach you're talking about has never worked. The result simply is not attractive enough, so the demographic never grows. LA has a huge advantage over NL in that due to its small size, very little infrastructure is needed to support a similar size of population. By comparison, NL has about 81000 miles of road. That's about 12 times as much per capita. To go with this, 18000 miles of cycle path are needed. If LA can get away with just a 12th of the cycle paths to go with its much smaller road network, then you're looking at building just 1500 miles of cycle path. Simply put, only about 1/12th of the cycling infrastructure is needed per capita, and it'll cost about 1/12th as much as doing the same job for the same population in the much larger area covered by the Netherlands vs. LA. Potentially, LA could get away with spending far less on cycling infrastructure than the Netherlands does to achieve a decent result: $60 million per year would be enough to make a good start. Ben: 1700 miles of lanes is not what they are promising. No-where near it. That's the point. If they were, then it could be enough to make a difference, but only if we thing LA citizens really only needs a 12th of what the Dutch need. My question remains: what are three concrete steps ordinary citizens can take to move things in the right direction here in Los Angeles? I think this could encourage a discussion that is more productive, especially since this advice could be linked to the incredible information on the nuts and bolts of bicycle infrastructure already on this website. 1. Big improvements to cover a few districts of the city are more powerful in effecting change than watering down the quality and spreading it around. i.e. Try to build a comprehensive network of proper cycle paths in one corner of the city. This will create something that everyone can see works well, and which can be expanded to cover the rest of the city over time. If instead you aim at sharrows to cover the whole city, you'll achieve very little change anywhere and the effort will look to have been wasted. What's more, once a street has "been done" with sharrows it is far more difficult to make a political case for it to be improved again. Politicians can say they've already done what was requested in a particular street. The existance of sharrows or on-road bicycle lanes can get in the way of proper infrastructure being considered. The Dutch found that only a comprehensive network of very good quality provision covering an area has an effect on modal share. This is what to aim for. 2. Don't be overly enthusiastic about small improvements. Ask for the best possible quality, not "what is achievable". If a compromise is made, then it should always be clear that it was a compromise, and that better will be needed in the future. Perhaps at the time of the compromise there should be talk of how long this will last until it will be replaced. 3. Don't accept the money argument. Actually, $60 million a year is peanuts. The Dutch spending $700 million per year is also peanuts. How much does LA spend annually on improving roads for drivers ? Work out the per capita spend for your city on drivers and cyclists and make a fuss about it. "How much does LA spend annually on improving roads for drivers . . ." Per Lane Mile? That's the question that will illustrate how very little money is allocated for cycle infrastructure. In fact, if the increase in bicycle modal share can take the load off the motor roads just enough to obviate the need for just one new highway interchange or connecting arterial spur the cost of a comprehensive, metropolitan area wide bicycle network built to Dutch standards would be approximately - Nothing. Not so much as one damn peanut. And it could be installed in no more than 5 years. To take a finer focus on James Kunstler's statement, the motor system of LA is the greatest misallocation of resources in the history of the world. When the money issue is raised you are being played for a sucker. I found a document stating that LA county has a budget of about 3.8 billion dollars, and spends 667 million a year on roads and streets. So 10 million would constitute 1.5% of that budget. I am a bicycle planner in the Los Angeles area, although I do not work for the City of Los Angeles. I find your article and comments rather frustrating as I think they drastically de-value the effort put forth by the cyclists advocating for a more bicycle friendly Los Angeles. It must be lovely to sit somewhere and righteously spout off at how your way is better when you are in the Netherlands where the first cycle path was constructed in the 1890's. If Los Angeles had 120 years to work on cycling infrastructure we might be a bit farther along. Instead we are still trying to change the hearts and minds of (arguably) the most auto focused city in the world. Something that the Netherlands has had the benefit of never having. 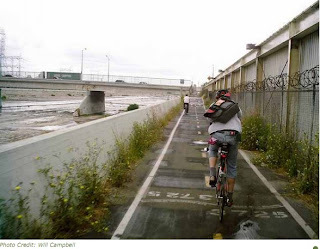 "If Los Angeles had 120 years to work on cycling infrastructure . . ."
kfg: Thanks for the link. You're right, of course. Early attempts at building cycle paths were everywhere, including the USA. As I pointed out before, the USA was once the land of the bicycle. It could be so again with a bit of effort. Cory: Nice as it is to see, the bicycle path shown at kfg's link is of course no more relevant to this discussion about 2011 than the age of the oldest cycle path in the Netherlands. The Netherlands spent most of the post-war period until the 1970s changing its infrastructure to resemble that of the USA. Existing cycle paths were ripped out and more space made for cars. Town centres were transformed to be more car oriented. This was a time when huge roads were built through towns, such as this one. The town I live in now was clogged with cars. By the 1970s, the Netherlands was on its way to becoming just as motor dependent as the USA. It is what happened since just the 1970s which is significant. LA's first bicycle plan dates from 1977. There was a further one 20 years later. Neither of these plans had particularly high aspirations and even 34 years after the 1977 plan, only roughly half of what that plan intended has been achieved. On the other hand, it took only fifteen years for the Netherlands to turn around from the dark days of the 1970s until the country could be proud of what its infrastructure had achieved. Vastly more work was done in a much shorter time over a far wider geographical area. Due to a policy in many towns of renewing roads and cycle paths every seven years, almost nothing still remains from as long ago as 1990, and since that time, everything has got better. It's never too late to start, but to achieve real change in the perspectives of normal people so that they will view cycling as something which is part of their lives requires that you make significant changes to the infrastructure over a relatively short period. Lacklustre plans like those of 1977, 1996 and 2010 are not nearly enough to achieve real change. Doesn't the last 34 years of not-much-progress-at-all demonstrate that bolder steps are required ? A few sharrows on busy streets is a very long way from what is required. I live and work in the San Fernando Valley, which contains about a third of the population for the city of Los Angeles. Most of the bikeway treatments in L.A. have been in the valley, due to not having to take away parking or a car lane to put them in. So it would be fair to say that the bike lane treatments in the valley are an indicator of the potential success of getting people to cycle in the rest of the city for the next few years. My above post containing the video of the Orange Line bike path is a good portion of the route I take for traveling to work and it is part of the only bike path that goes east/west across the valley. The video contains 15 major intersections and five of them have a bike lane or signage designating a bike route that crosses the bike path. The amount of cyclists along this corridor has increased probably by double digit figures in each of the last two years, yet the bulk of the ridership is still overwhelming young adult males. The longest of the bike lanes that intersects the Orange Line bike path is on Reseda Blvd, at about nine miles long, and the majority of the cyclists seem to be riding on the sidewalks. There were Sharrows or shared lane markings applied at a half mile section that contains a busy intersection. The Sharrows are put further out from the curb than bike lanes typically are in Los Angeles. They are meant to show where the cyclist should ride to avoid parked car doors and following this guidance puts the cyclist in front of motorized traffic. Not surprisingly, few cyclists on busy Reseda Blvd seem to ride along the Sharrow markings. The Orange Line bike path, which does not cross any other bike paths, does get some very young riders, including preschoolers accompanied by their parents and perhaps a greater proportion of female to male riders than there is on the street. I've never seen anyone probably younger than 15 on the street, even with a bike lane and perhaps, at most, 10-15 percent of all riders are female on the street. My conclusion is that putting a network of unprotected bike lanes has the potential of increasing the commuting ridership in L.A. from about one percent, to a maximum of about where Portland Oregon is at 5.9 percent and it took Portland about 18 years to get there from a starting point of about where L.A. is at now. That's a big increase, but Sharrows and unprotected bike lanes doesn't seem to have much potential to increase commuting ridership to ten percent as it's likely to be mainly just young, predominately male, adults. To learn about some of what it took for Portland to achieve it's bicycling ridership and to find out what it can take for a U.S. city to achieve this, I recommend that you read Mia Birk's book entitled 'Joyride'. Mia was the Portland bicycle program manager from 1993-1999. Chapter 11 is Painting the town blue and in it she describes visiting 18 different European cities to gather best cycling practices (Houten was her ideal city, if Portland started from scratch). Upon her return to Portland, she found out that none of the bike infrastructure techniques of these cities were allowed under the Manual on Uniform Traffic Control Devices (MUTCD), which is the bible for traffic engineers in the U.S. The MUTCD is probably why the Dutch cycling experts stated on page 27 of the Chicago ThinkBike final report that outdated engineering standards were one of the weaknesses to making bicycling improvements. The funds dedicated to bikeways in Los Angeles is equivalant to about 4 percent of the amount listed for transportation, street services and street lighting in the cities annual budget. Much of the bikeways funding comes from sources outside of the city and they are a major stimulus for L.A. to do anything for bicyling. The Orange Line bike path was paid for by the county Metro mass transit operation. Most of the current installation costs of bike racks and putting bike lanes or Sharrows on the street in L.A. is paid for by the five percent set aside for bike infrastructure improvements, which comes out of L.A's share of the fifteen percent distributed to the 88 cities in the county from a half cent sales tax for mass transit and roadway improvements that was approved by voters when President Obama was elected in 2008. L.A. gets about a third of these funds in proportion to the cities population of the county. It's clearly not written by any kind of expert, but this short blog entry perhaps gives a good sense of the popular challenge to high-quality infrastructure in L.A.
Notice the phrase "ultimate commitment" and also the gem "Even with the new lane, riders still gotta be cautious because there are some crazy drivers in BH, believe you me." @Cory, the current plan is not going to be scrapped because of David's comments, but at the same time a lot of people here are approving of his criticism which is, I feel, not to the taste of the Everything is Good Committee which is the sole birth mother of communications staff into almost all of the bike-promotion NGOs in the USA. But in a way this disease extends to the general public. See the first comment to the blog entry I mention above: The commenter more or less says that bike lanes do not work on busy roads, but is apparently not aware that there are ways to make these roads much safer. So the professionals are deceitful in their cheerleading whereas the public is mostly just ignorant, with the former enabling the latter. L.A.'s problems are not with the document or the overall plan. L.A.'s problems are political, and they have been so seemingly forever. Cycling infrastructure comes in nearly dead last on a long list, and the lanes and paths we do get are designed to accommodate cycling rather than encourage it. This newest document has been a long time in the making, with some of the best planners in the country shaping it. Its language is encouraging by comparison to nothing, which is quite possibly the only other viable alternative. (At some point, the plan may have been seen more as a funding document than one with serious intent.) I believe there's no real political will -- either from politicians or the populace -- to increase the number of cyclists in the city. It's a mistake to read too much into the plan's stated intent. I have the impression that there are more cyclists on the road now, at least by comparison to a few years ago. Too, the mayor's visit to Copenhagen for the 2009 climate conference did much to change his opinions on cycling. But neither of these items can change the glaring fact that drivers dominate. If we had a large group of anybody -- parents, children, somebody -- protesting for better cycling paths, we might see some change. But we don't have them. We don't have the numbers. It was bicycle advocates who fought for changes to the draft plan, from having potential bike lanes on arterial streets, to making lanes a top priority in the final plan. I was against the idea, as I didn't believe that it was politically viable and this fight would just delay implementation. The main idea for the first draft was to have most new bike infrastructure on secondary streets and call them bicycle friendly or as most cities call them, bicycle boulevards, and Portland is concentrating on improving theirs to expand ridership. But most of the bicycle advocates in L.A., who were speaking up the loudest, hated the idea and felt that they were being pushed off to areas where most people did not want to ride. The city needed a new plan in order to continue to get millions in funding for bicycling projects and the political will seemed to be for the changes, so the city backed taking space away from cars and putting bike lanes into the forefront. Plus, there was a noticeable growth in bicycling for Los Angeles in the last few years. The U.S.,as a whole, just cannot figure out how to put bicycle paths in, other than next to rivers or railroad tracks. That is where Los Angeles has put them. The Orange Line BRT bike path follows an old Red Car trolley way that stopped running in the early 1960's. It will be extended another four miles north next year. To put a bike path in, next to a major street, would mean taking away at least one car lane and parking on one side of the street. That's a minimum of seventeen feet and perhaps as much as twenty feet. Compare that to taking away one car lane for two five-foot bike lanes. That would only require restriping and you can see how much more politically viable that is. If you look for "A sad post" by Luiz Leite on September 4, and as a reply to this post "The story of the Herb Anders Wahl Eversharp artifacts" by Len Provisor, you'll find some photographs of this Herb Anders on his first job in a Chicago bicycle factory. Detail: "Herbert Anders as a young boy (second from right) in Chicago employed by the Rambler Bicycle Co. located at Lake & Wacker Streets near downtown Chicago where nearly 60 bicycle manufacturers were located within a one mile stretch on Lake St. This company was formerly the Gormley & Jeffrey Co. and Chicago bike makers produced about one half of the 1.2 million bicycles made in 1899. Rambler Bicycle eventually became the Rambler Motor Co. making the Nash Rambler…. anyone remember those cute little Rambler Ambassadors from the early 60's?" Bikes definitely were no rarity then. Logically, as there were hardly any cars yet. People tend to forget elementary historical facts. I am not very optimistic about a future for bicycle infra in the US. Having seen most of the country and lived there for over 10 years i can only conclude that traffic infra is not a huge priority. Traffic infra is of a poor quality everywhere ive been. Even in wealthy areas there are cracks in the roads (that may or not get fixed). Many neighborhoods dont even have sidewalks. Shopping is often on arterial roads with little pedestrian crossings to cross the street on foot or bike. Depending on where you live you may not even be able to walk to a grocery store without a huge hassle. The point im trying to make is that people dont seem to care about their infra at all. In NL all traffic infra has a higher priority than in the US. As a result bike infra is of the same quality as car infra. Sadly, bike infra is also of the same quality as car infra in the US. Not that great in general.